After leaving 15th Ave Coffee and Tea we continued down the street towards what would turn out to be the second stop of our Seattle Coffee Crawl. We didn’t set out with a specific plan in mind. 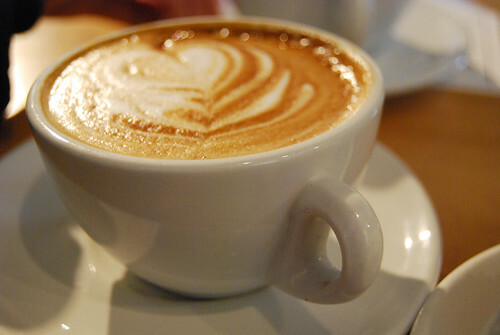 Rather we wanted to hit up as many of the “well known” Seattle coffee places as we could. 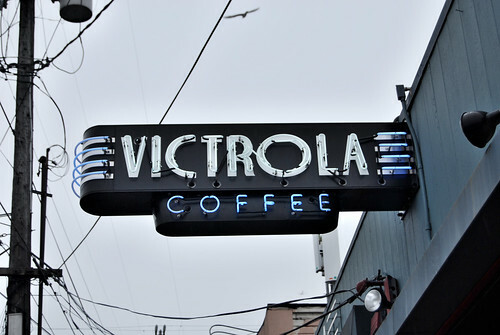 We had always heard about Victrola and figured since it was just down the street and across the way, it would be our next stop. 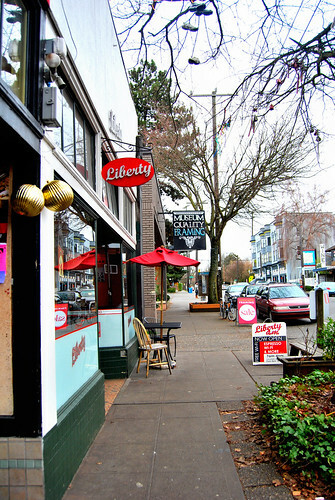 However, there were some serious contenders for stop #2 along the way, including Liberty, which proudly brews Stumptown. Since we had hoped to visit the actual S’town shop, we skipped it. 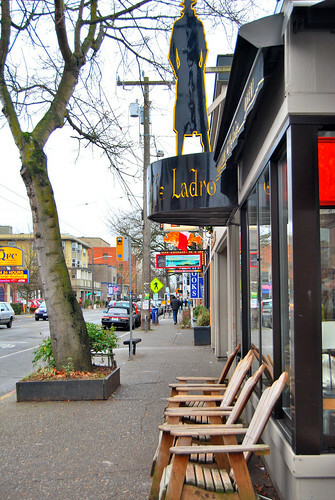 Then we came across Cafe Ladro which looked nice, but didn’t really grab our attention. We thought their signage was pretty cool but that wasn’t enough to lure us in. 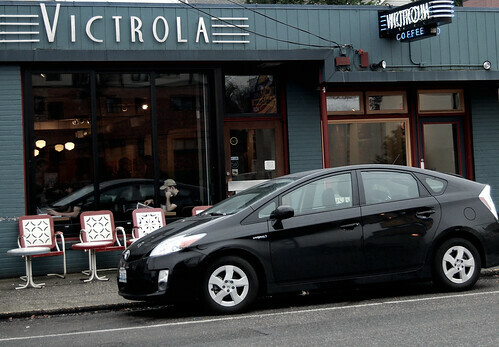 Finally we arrived outside of Victrola. Wow it was packed! There were hardly any seats available. It was full of singletons taking up tables meant for four people. Pretty funny actually. Basically we got a table for two and “borrowed” a chair from a nice guy that was quietly studying his thick textbook. Since it had been way too long since I last had a cupcake (Cozy Cave was closed, as was the famous cupcake shop in Vancouver) I ordered one at Victrola, along with my latte. 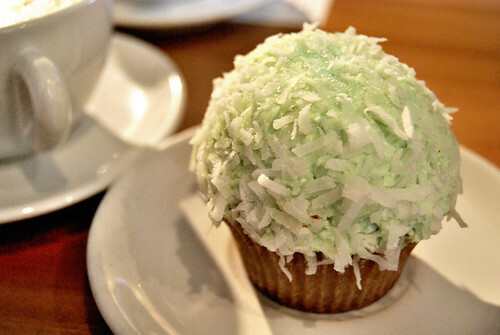 I was told it was by Yellowleaf Cupcake Company which is a local Seattle shop. I’m not sure what flavor it was, but it was green, amazing, and dubbed the “Christmas Cupcake” by the nice guy working at Victrola today. It tasted a little bit like lime, but both the frosting and the cake had great flavor. Really good! My latte was okay. I mean, I guess it was good, but it wasn’t really memorable…having said that, it is obvious that this place has a loyal fanbase because, as I mentioned earlier, it was packed! It was super loud in there!